In keeping with Connecticut’s Beardsley Zoo’s mission to put animal welfare first, animal care specialists got up close and personal with the Zoo’s pair of American alligators last week. The two nine-year-old reptiles, Randall and Dante, were due for their annual veterinary exam. The fact that alligators are extremely dangerous was not a consideration in scheduling their veterinary appointment; how to catch them and hold them still for the doctor was. Key to safety was a team of experienced caretakers, each with a very specific task assigned to them. 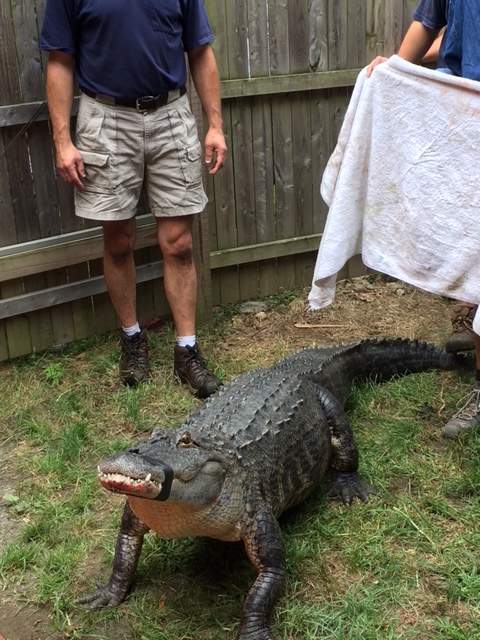 Animal Curator Rob Tomas gathered a group of six caretakers, and detailed plans for catching one alligator at a time. “Each caretaker has a very specific job, and when things start moving fast, you have to stay focused on the one task you were given to do,” said Tomas. It’s easier to catch an alligator on land than it is in water, so the first retrieval took place while Randall was sunning himself by the viewing window, to the delight of Zoo guests. A small loop was slipped over his head, then his eyes were quickly covered to keep him calm. 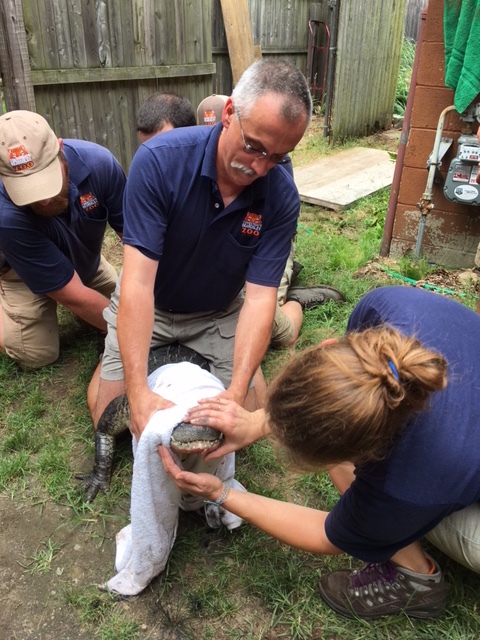 Once captured, the alligator is brought to the back of the exhibit, where he is weighed and measured. The veterinarian carefully examines his body for any damage or signs of illness, then he is quickly returned to the pond, another potentially dangerous operation. A sigh of relief from Tomas, Thatcher, and Barker, then it’s time to catch his pond mate, Dante. Dante presented a bit more trouble by returning to the water and eluding his captors for nearly an hour, offering Zoo guests a thrilling view into the depth of commitment by the caretakers. At one point, Tomas waded into the pond with the two alligators to help the caretakers on land with the loop. Eventually Dante, too, was safely secured, and underwent his vet exam. Randall measured 106 inches, or 8.8 feet long, and 187 pounds. Dante measured 95 ¾ inches, or 8 feet long, and 175 pounds. Both had grown slightly since last year, a sign of their good health.